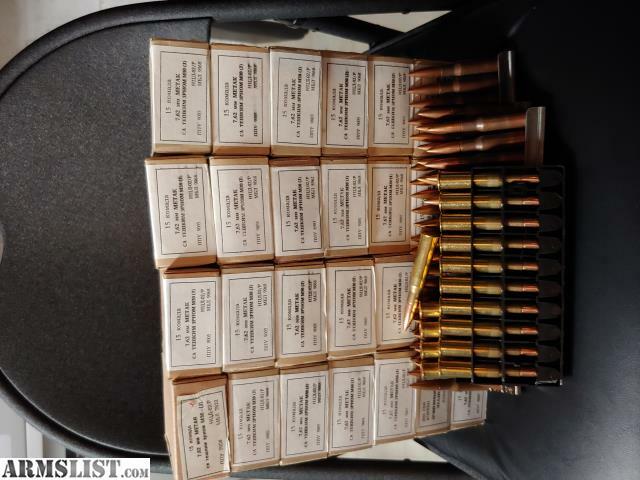 More than 550 rounds of 7.62x54 ammo. The below is a description of the bulk of it, 510+ rounds (about 34 boxes of 15 rounds each). The other 40 or so rounds are 147 grain ball. Take the whole lot for $350. Currently the cheapest I can find this on Gun Broker is $11.44 per box of 15 ($385) and I am throwing in the 147 grain stuff. No shipping or credit card charges either. This is widely considered to be the best 7.6x54r surplus available. Made in the 1980's and 1990's (various headstamps in the lot). This ammo has brass case, berdan primed, lead core, copper jacketed projectiles (no steel at all).